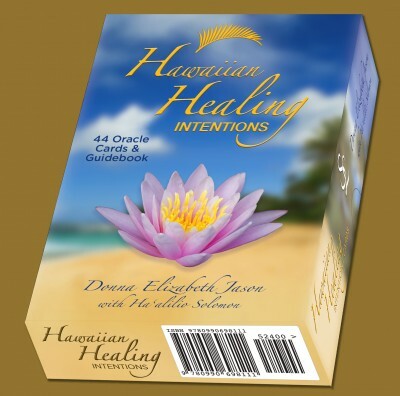 This Hawaiian Healing Intentions Ebook contains all of the insights, intentions and guidance of the Hawaiian Healing Intention Cards Boxed Set. A detailed pronunciation guide for the Hawaiian names is a bonus feature of the ebook. Beautiful color images of each card plus digital text makes sharing your favorite cards easy! Through the use of intention you have the power to improve your life, cultivate inner-calm and live in alignment with your soul’s purpose. Designed to be used in everyday life and for massage, lomi lomi, reiki and other healing sessions. The Hawaiian Healing Intention eBook is an inspirational and educational tool for you to use in everyday life and, or, in healing sessions. 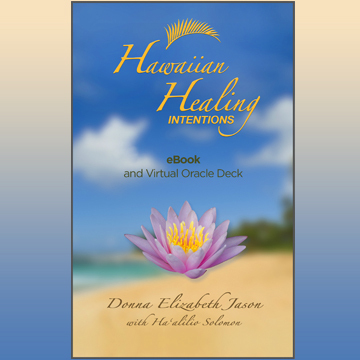 This ebook contains beautiful images and text from the 44 Cards and Guidebook contained in the Hawaiian Healing Intention Cards Boxed set. In addition, it has a Hawaiian Pronunciation Guide. You can hear the pronunciations of each of the Hawaiian names spoken by Haʻalilio Solomon, a professor at the University of Hawaii. The Hawaiian Healing Intentions Ebook can be used personally or professionally as a way to inspire your day, bring meaning to your work, or help your clients, patients and students deepen their journey. If you already own the Hawaiian Healing Intention Cards, you can use the ebook to copy and share intentions with your friends and clients.